Wheel Woolies clean wheels with any size opening. They’re safe on any wheel finish and the wool compresses to fit into tight spaces. Three sizes are available to suit any detailing job. With 3 different sizes available, Wheel Woolies make cleaning wheels effortless. 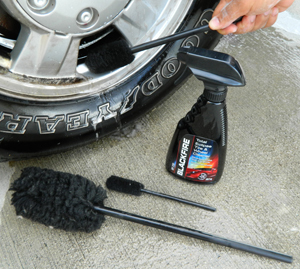 Wheel Woolies are also very effective on car grills, motorcycle pipes and wheels, boat fixtures, and anywhere else you need a compact cleaning tool. The long handle on each Wheel Woolie lets you clean without getting your hands dirty or scraping your knuckles. The longest Large Wheel Woolie is 19 inch long and has a 3 inch diameter wool head. Use this long handled Wheel Woolie to reach deep into the wheels or clean the wheel wells of any vehicle, from cars to RVs. The Medium Wheel Woolie is over 12 inches long with a 2 inch diameter wool head. This one is ideal for smaller wheel gaps, air diffusers, door jams, engine areas, etc. Use the Small Wheel Woolie for small gaps, like grills, and narrow spoke wheels. It is 8 inch long and 1 inch in diameter. Pack includes all three sizes.